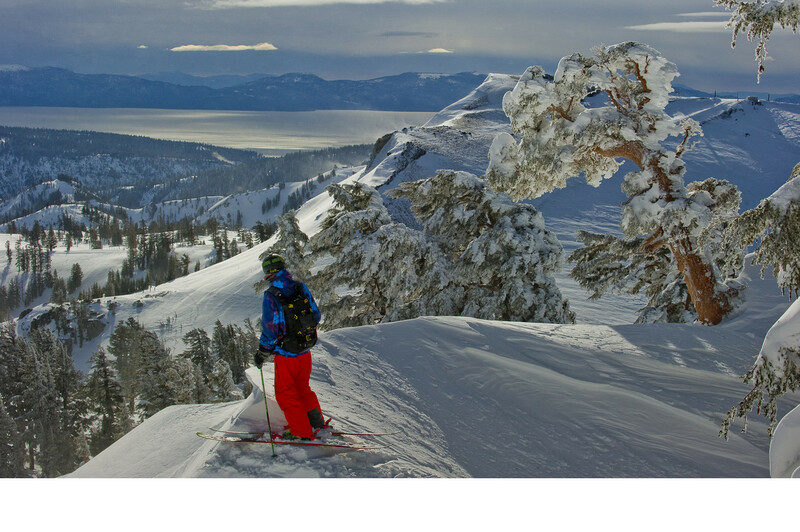 Squaw Valley | Alpine Meadows is an internationally renowned ski resort in North Lake Tahoe, California that spans more than 6,000 skiable acres. The resort features 42 lifts and 270 trails, as well as the European-inspired Village at Squaw Valley featuring nearly 60 restaurants, bars, boutiques and art galleries. Snowfall averages 450 inches, providing one of the longest ski and snowboard seasons in Lake Tahoe and establishing Squaw | Alpine as a top destination for spring skiing and boarding. Squaw | Alpine also boasts one of the region’s only mountain-top beginner areas and several intermediate skier havens, including Shirley Lake and the newly renamed Pacific Crest Bowls. Squaw can look intimidating to beginners due to the steep terrain right out of the village. The High Camp Cable Car, also called the Tram, rises up and over the Tram Face, virtually un-skiable terrain where Squaw holds an extreme competition yearly for the world’s elite. But don’t be fooled: there are fantastic beginner runs located at mid-mountain. Take a leap of faith and ride the tram to High Camp, where four lifts offer mellow groomed beginner and intermediate trails. The payoff is extraordinary lake views, as well as the feeling that you are high in the mountains and away from the run-of-the-mill lower-mountain slopes that most resorts provide for newbies. High Camp is a mountaintop meadow tucked between high peaks where experts can get an adrenaline fix before meeting up with less skilled family members for lunch. High Camp has a swimming pool and skating rink as well as outdoor seating, providing an inspiring setting for all ability levels. For young children, the Papoose beginner’s area is on the far eastern side of the parking lot beside the SnoVentures Activity Zone where you will find mini snowmobiles for kids and snow tubing for all ages. This is the learning ground for first-timers, completely unintimidating and with free hot chocolate. For intermediates, Squaw Creek lift offers un-crowded runs and beautiful lake views, with groomers that loop down to the Resort at Squaw Creek on far looker’s left of the resort. Squaw Creek offers classic American skiing, with trails cut through the trees—something you don’t get much of in the wide-open expanses of Squaw. Upper-mountain intermediate terrain is accessed by the Shirley Lake Express, a fast six pack lift perfect for doing laps. The Gold Coast six pack lift provides advanced intermediate runs. Round out the day with some laps on the Solitude lift, which drops down from High Camp into groomed and un-groomed intermediate runs, glades and tree islands. For skiers who like to hike, Squaw has bountiful options. Granite Peak, accessed via Granite Chief, is the resort’s highest point at just over 9,000 feet, so it loads well on powder days and offers lots of hidden stashes days after a storm. Hidden Bowl features steep wide open terrain and tree shots, making this area prime for exploration. The Palisades chutes are some of the most infamous “Squallywood” terrain, featured in countless ski films. If you go big here, lots of chairlift riders will be watching and cheering. Access Palisades via the Siberia Express, but be prepared to handle a cornice drop. Lesser skilled skiers should stick to the easiest of the Palisades chutes, National Chute to looker’s left. Named for Olympian Jonny Mosely, Mosely’s Run is a severely steep bump run that Jonny credits with giving him the skills to handle the world’s toughest moguls competitions. Squaw will never win any awards for its tree skiing—there simply isn’t that much due to the mountain’s vast open expanses—but those who seek a forested environment should head to the Squaw Creek and Red Dog lifts, as well as the lower sections of Granite Chief. The terrain at Alpine Meadows ski resort consists of wide open bowls, long groomed slopes and abundant natural features within its 2,400 skiable acres. The ski area’s front and backsides boast plenty of beginner, intermediate and advanced options. Alpine Meadows offers some of the best skiing and riding in Lake Tahoe with the newly named Pacific Crest Bowls, offering backcountry access to expert skiers with the proper equipment. Take the short (or long) hike out to one of these bowls, and then end up back at a high-speed chairlift. From the summit of Ward Peak, visitors can take in spectacular views of the surrounding mountains and Lake Tahoe. Beginners and intermediate skiers have numerous terrain options on both sides of the mountain. The front side is home to long groomers and some excellent intermediate runs off Roundhouse and Hot Wheels chairlifts. Then take Rays Rut around to the backside, where you’ll access some of Alpine’s best advanced–intermediate runs. The first lifts to open are usually the Red Dog and KT-22 lifts. “KT” is the most coveted, and people line up at 6:30 a.m. to be the first to reach The Fingers, which are amazing when covered in deep snow but sketchy once skied out. Nose to Fingers is considered one of the best gets on the mountain. Access Nose by skiing looker’s right of the KT-22 lift towers. The Fingers are a band of rocks about midway down the mountain. To avoid the charge up KT-22, take the Red Dog lift instead. Its terrain is less skied but equally as challenging without the crowds. Poulson’s Gulley, to skiers right of the lift towers, and Heidi’s Rock are favorite steep and deep runs from Red Dog. Heidi’s Rock requires a short hike and is reached by disembarking toward Red Dog Ridge. If the snow falls all day, head back to KT, which provides so much expert terrain that it hardly matters where you go because there are so many premier lines. The Funitel (don’t call it a gondola!) will typically open next. Ride it to High Camp and ski down to the Siberia Express lift, which whisks you to the ridgeline and the top of Siberia Bowl. On big snow days, the lifts typically open from looker’s left to right, with Granite Chief often last to open. Granite Chief is located on the far boundary to looker’s right, providing a bevy of unnamed runs and expert terrain where the crowds are often minimal, perfect for an afternoon expedition on a powder day. The resort is home to some great terrain for the powder lover. When snow is in the forecast, head to the lifts early to make sure you get fresh tracks. Hop in line at the Summit Express as this is one of the first lifts that will be open. Just off the top of Summit lift, the D’s are a great first choice powder run, named for an old D8 tractor that accidentally slid over the edge while trying to clear a road to the summit. Having merged with Squaw Valley, you can now take the free Squaw/Alpine shuttle between resorts, skiing and riding both mountains on one lift ticket. The Ice Bar is a local’s favorite and can be found at the base of the Sherwood Bowl. Here you’ll find quick bites and cold beers in a beach-like setting. Stay ‘till happy hour on the Alpine Sun Deck and catch some great live music in the spring. Located in the base village a short walk from the lifts, Mountain Nectar offers fresh-squeezed juices and smoothies, as well as coffee, tea, bagels, wraps and tables for sitting down with children. For a fast cup of coffee and a muffin, Starbucks is located in the base village, with the world's first ski-through location on the mountain as well. The Arc in the Gold Coast mid-mountain lodge is the place to gather without leaving the slopes. The menu features Kobe beef burgers, Asian bowls, soups and more. For those who don’t mind walking into the base village, Mamasake is a favorite lunch spot, featuring a Cal-Asian menu of sushi, sashimi, bento boxes and tapas, along with a variety of sakes. High-end: PlumpJack Café is located a short walk from the lifts and village lodging. The menu changes seasonally, with a focus on local ingredients and novel wine pairings chosen by the sommelier. Daring foodies will go for the crispy veal sweetbreads, while meat lovers will enjoy the ribeye with bacon confit potatoes and haricots verts. Located in the Resort at Squaw Creek, Six Peaks Grille features biodynamic seafood and produce. Starters include the wine braised short ribs with black truffle cheese, and mains featuring a variety of heritage meats and a uniquely prepared Columbia River sturgeon. Mid-range: 22 Bistro is located in the village near the KT-22 lift. Specializing in tapas and social plates, as well as reasonably priced salads and burgers, 22 has a children’s menu and a to-die-for dish of potato-bacon donut holes. Low-key: Fireside Pizza in the base village serves up gourmet pizza and pasta and is ideal for budget-conscious families. Fireside is known for its sourdough crusts, and their signature pie is the pear and gorgonzola. Aprés: With a large outdoor seating area, Le Chamois is the main gathering spot for beer drinkers and is one of northern California’s largest sellers of Budweiser. Regulars buy the $40 Buddy Pass, good for 20 pints of Bud. Duck inside to warm up and sit down in the Loft Bar, which is decorated with ski schwag from the 1970s and earlier eras. Just around the corner from Chamois, PlumpJack Bar located at PlumpJack Café has a daily happy hour from 3 to 6 p.m. for those seeking a more formal setting. Wine lovers can experiment with the “mystery wine flight” with three half pours for $15. Nightlife: Cornice Cantina is a great option for après on the sundeck or late-night drinks indoors. DJs spin dance music on Friday and Saturday nights, making the “Cantina” a favorite local hangout for off-duty patrollers and Squaw employees. It’s located in the middle of the East parking lot, a five-minute walk from the base village lodgings. In the heart of the village, the Auld Dubliner is modeled after a rural Irish pub and features live music on weekends as well as a large beer and whiskey selection.